Patients who undergo minimally invasive spine surgery at New Jersey Spinal Medicine and Surgery typically experience less postoperative pain, return to activities faster and have a smaller/less noticeable scar than patients who undergo traditional spine surgery. The reason why these benefits are seen is because minimally invasive spine surgery is performed using a smaller incision. Therefore, the muscles and soft tissues in the area experience far less surgical trauma. The most commonly performed minimally invasive spine surgery procedures are a discectomy, laminectomy, artificial disc replacement and minimally invasive spinal fusion. Below are brief overviews of when these procedures are used and how they are performed. A minimally invasive discectomy is used to treat a nerve that has been pinched by a herniated intervertebral disc and is causing localized pain and/or pain that radiates into the extremities. During a minimally invasive discectomy procedure, our orthopedic spine surgeons remove only the portions of a disc that are pinching or compressing a spinal nerve. This process is sometimes referred to as decompressing a nerve. Patients who undergo a minimally invasive discectomy experience symptom relief in a very short period of time. In many cases, relief occurs almost immediately after surgery. A minimally invasive laminectomy is also a procedure that is used to decompress a pinched spinal nerve which causes localized pain and/or pain that radiates into the extremities. Our orthopedic spine surgeons perform a minimally invasive laminectomy by removing the back portion of the vertebral wall (the lamina). This creates space for the once pinched nerve to return to its normal position and quickly relieves symptoms. Minimally invasive laminectomies afford patients an alternative approach to a surgery that was once strictly performed using a large open incision. An artificial disc replacement (ADR) is a surgery that is typically performed to treat neck pain that is associated with movement. During an ADR, our orthopedic spine surgeons remove a diseased or damaged intervertebral disc and replaces it with an artificial one. This artificial disc provides the same support and stability as the original spinal disc and allows for rotation and movement of the neck. Following surgery, patients are able to move their neck without pain. For certain patients, an artificial disc replacement can be a great alternative to a spinal fusion procedure because it restores movement. A minimally invasive spinal fusion is also a procedure that is used to treat pain associated with movement. Following a spinal fusion, bone graft fuses with real bone to form a single, solid bone. If you are someone you know is experienced unresolved spine pain, please contact our offices in Glen Rock and Maywood, NJ. 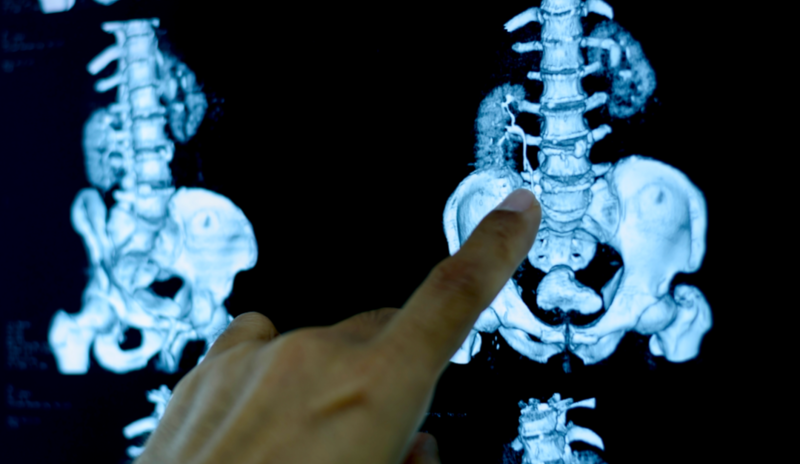 Making an appointment with one of our expert spine surgeons is easier than ever. One of our Orthopedic Spine Specialists will find out what is causing your pain and then come up with a personalized treatment plan.